Meghan Markle and Kate Middleton both have quite extensive wardrobes with all the royal events and outings they have to attend. But even royals have their favorite pieces and designers that they turn to time and time again. 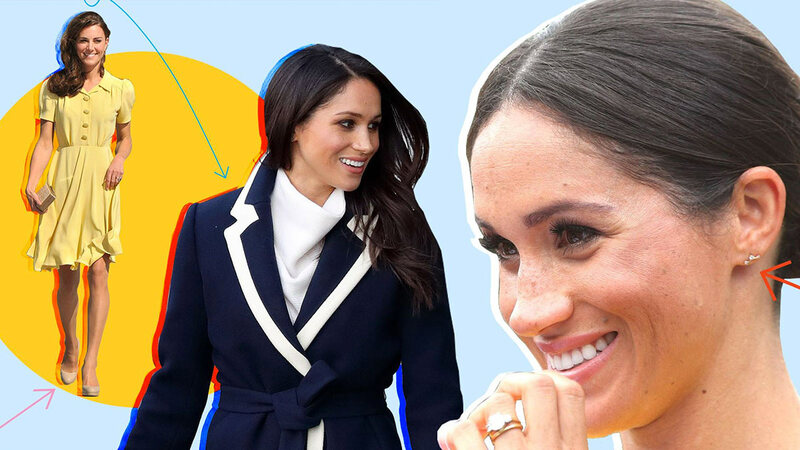 Here, 30 of Meghan and Kate's favorite fashion brands. 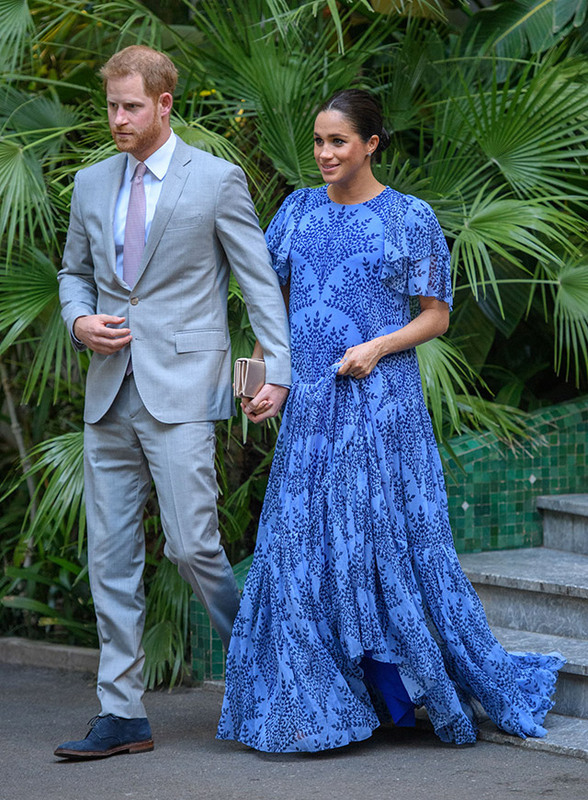 Meg donned this gorgeous patterned gown by Carolina Herrera during a royal visit to Morocco, but it wasn't the first time she wore a piece by the designer. She wore this pale pink ensemble in June 2018 and this belted denim number in July 2018 by the same brand. McCartney designed Meghan's stunning wedding reception gown, and, since then, it appears that the British designer has been a go-to for the Duchess. On International Women's Day in March, she accessorized her Reiss dress with a chain-trimmed black clutch from the label. When Meghan was in Australia last October, she wore a pair of Castañer espadrilles to a couple royal engagements—although she had to take them off to navigate the sandy beach. Another fashion staple she wore Down Under was a pair of Krewe sunglasses she sported several times, including on a boat tour of the Sydney Harbor. The black frames with gold accents looked undoubtedly chic, and—of course—quickly sold out. In February 2019, it was hard to miss Kate when she stepped out in this bright green shift by Eponine. The London-based brand loves a good retro-looking design like this gingham dress with button details that Kate wore in 2016. Kate wore a black-and-white polka-dot Topshop dress while she was pregnant with Prince George in 2013. She wore another look by the affordable U.K.-based brand during on a royal tour of India in 2016. Kate is frequently spotted wearing the brand's popular neutral "Sledge" pumps made of patent leather, as seen here in 2011. The label also makes clutches and clothing, which she's worn on several occasions. The Duchess has sported several Kate Spade pieces, like a pair vibrant red tassel earrings she wore in 2017 to a fundraising event, to royal outings. She also wore a polka-dot dress by the designer the day after Prince Harry and Meghan Markle's engagement announcement. Meghan launched this Spain-based handbag brand in the spotlight when she wore the label in the weeks following her engagement announcement. She can't stop wearing Strathberry's leather purses with gold accents, like this forest-green crossbody she matched to her coat while visiting Scotland in February. She wore a green trench by the Canadian-based chain to the U.K. Team Trials for the Invictus Games in April with Prince Harry. She also wore a burgundy dress by the retailer in September. Kate nearly broke the Internet when she wore a navy long-sleeve Reiss dress for her engagement portrait with Prince William, and she notably wore a neutral sheath when she met the Obamas in 2011. She paired it with a clutch and black heels while speaking with then-First Lady Michelle Obama. The baby blue polka-dot number Kate wore after giving birth to Prince George in 2013 is perhaps the most iconic Jenny Packham look of hers. It's one of the more casual designs by the label, which is known more for the stunning gowns Kate wears to official events. Another fast-fashion brand Kate can't seem to get enough of is Zara. In December 2013, she wore a statement necklace by the Spanish retailer that only cost $35 (P1,843.80), and she owns several dresses that she wears on more casual occasions, like when she watched this polo game in June. As the name suggests, it's a London-based brand, so it makes sense why the Duchess tends to wear it so often. Temperley London is known for its elegant silhouettes that still have a sense of fun with patterns and embroidery, like this black-and-white number she wore while on a royal tour of India in 2016. The classic pair of sneakers is a staple in Kate's closet, and the best news is that Supergas are affordable. Kate is fond of the white pair known as the "2750 Cotu" in canvas. She also wore them while on a royal tour of Canada in 2016, before embarking on a ship in Victoria Harbour. When it comes to jewelry, the Duchess of Sussex is particularly a fan of delicate styles, like a pair of gold Adina Reyter earrings she wore in July with a bright yellow Brandon Maxwell midi. The pair featured three diamonds in a triangle formation, making for a subtle yet unique accessory for the dressy occasion. Meghan wowed everyone with her chic, laid-back style at the September 2017 Invictus Games in Canada. The look included an oversize button-down by Misha Nonoo and a pair of medium-wash frayed MOTHER jeans, which sold out almost immediately. Kate's worn dresses by the Canadian and Turkish designer on several occasions, including in January when she was photographed in a gorgeous blue velvet number while pregnant with Prince Louis. She sported the midi dress, which featured bell sleeves and a high collar, on a royal visit to Sweden. Meghan loves a good pantsuit, as evidenced by this sophisticated Alexander McQueen set she wore in February. Although she didn't wear a McQueen wedding gown, as many people speculated, she nevertheless seems to appreciate the fashion house's timeless aesthetic. Meghan's penchant for delicate jewelry was apparent again during a visit to Scotland in February 2018, when she stacked numerous gold rings on three of her fingers. On her pointer finger in particular was a simple 14k gold ring by Brooklyn-based jewelry brand Catbird. Like Kate, Meghan loves J. Crew, and she was spotted in this navy wrap coat with white contrast in March. And yes, the coat, which retailed for $168, immediately sold out after her appearance. Stephen Jones makes the most fashionable hats worthy of the fanciest royal events. His designs were frequently worn by Princess Diana, and it's apparent that Meghan also has gravitated to the designer. She wore a chic neutral hat to match her dress at her first post-wedding appearance in May for the Prince of Wales' 70th birthday. The Spice-Girl-turned-designer was a guest at Kate's wedding (and Meghan's, too! ), so it makes sense that the Duchess is a fan of Beckham's fashion label. Here, she was spotted carrying a leather tote from the line while watching a polo game in June, pairing it with a Zara dress. The fashion house was responsible for Meghan's breathtaking wedding gown, but she's also leaned on the label for other looks. Case in point: the neutral sheath with a cape-like covering over her shoulders, which she wore to her first solo royal outing with the Queen last June. Meghan is friends with the designer, and there even was speculation he would make her wedding dress. Although she opted for a different design, she still wears Roland Mouret pieces on royal outings, such as a dove-grey bateau-neck dress during a visit to Ireland. Ralph Lauren, with its Americana aesthetic, makes perfect sense for Markle, whose home state is California. She wore an olive green dress with matching accessories for Prince Louis' christening last July; later in the month, she wore a striped shirt by the label while catching a Wimbledon match with sister-in-law Kate. 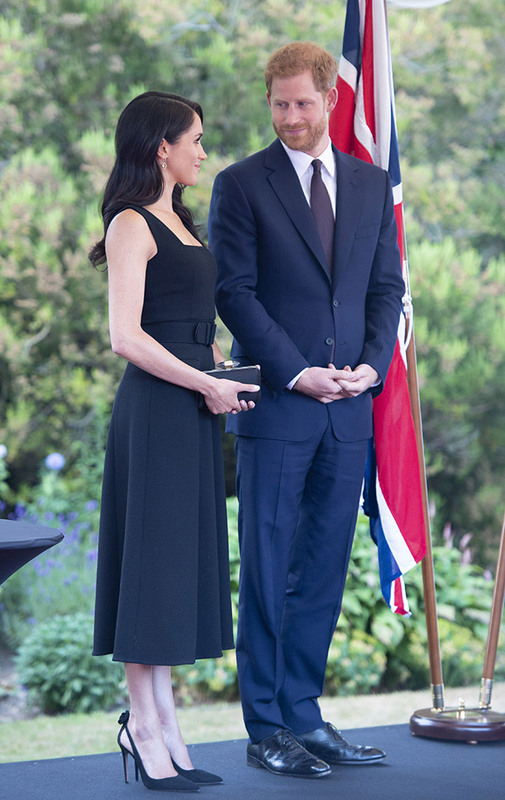 Meghan wore a pair of neutral suede heels by Aquazzura for her engagement photocall in November and wore black pumps by the same designer a few months earlier, in July. She paired the heels with a coordinating dress by Emilia Wickstead during a royal visit to Ireland. Meg wore Sarah Flint shoes even before she dated Prince Harry and continues to sport them today. She wore a pair of pumps during the couple's visit to Ireland, which she paired with a Givenchy pantsuit to make a super chic ensemble. She wore a stunning A-line midi with a bateau neckline exactly like her wedding gown at the the centenary of the Royal Air Force. She's also worn Dior shoes to multiple events, including the Nelson Mandela Centenary Exhibition, and is a fan of the fashion house's makeup. She's a reportedly a fan of Dior Backstage's face and body foundation, which she used on her wedding day. She's often spotted wearing the Canadian jeweler's studs in various styles. At the Nelson Mandela Centenary Exhibition in July, she accessorized her trench coat dress with white quartz silver earrings by the brand.